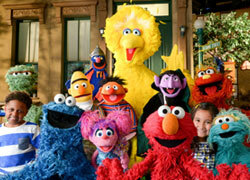 Discussion in 'Classic Sesame Street' started by minor muppetz, Aug 18, 2009. I brought this up before, but there are a few occasions where Bert doesn't loose his cool in the end: one of which is when they're trekking through the hot, steaming jungle to find Dr. Livingston -- all so Ernie could ask him, "What's up, doc?" Even Bert had a good laugh over that, when you would think he would have either blown up at Ernie or fainting over being dragged through the jungle just so Ernie could make that joke. Then, there's occasions where Bert actually gets the best of Ernie, such as when Ernie tried that repeating game where he has Bert phonetically repeat his drum beats, which Bert is able to do precisely each time, much to Ernie's befuddlement. For the last few years, I'd been thinking that the majority of really weird or bizarre Sesame Street segments were animated segments, with very few of the really weird ones being Muppet segments. 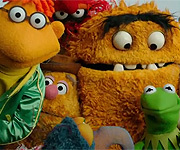 Of course there had been some weird Muppet segments, like The Geefle and the Gonk (though after watching it recently, I've been re-thinking whether it really is weird) or the cast singing "Surprise". But it seems like a lot of Ernie and Bert segments from the first season are somewhat weird, while many also seem to exist to have a pun as the punchline. Of course there would be E&B segments in later seasons that mainly exist for an ending pun, but it doesn't seem as common (and, somehow, the pun quality seems different). Especially many of the rare segments where details have been uncovered to the wiki from trusted sources (not to mention some of those season one episodes that surfaced from the vault in 2014). Examples of some of the more weird/odd Ernie and Bert segments: the four-part segment where Ernie pours and drinks milk for a very long time, the section of "Up and Down" where Ernie pours milk while upside-down, Ernie being able to clean the apartment in just 15 minutes, maybe the three-part segment where Ernie gives Bert a haircut, maybe the segment where Ernie cleans the apartment in under 15 seconds, the segment with a letter B buzzing around like a bee, maybe the segment where the letter A appears on their TV, Ernie looking for a Z and finding a weird-looking thing that ends up being a Z, Ernie erasing Cookie Monster. I feel like Bert getting his nose removed (which was most common in the first season) is tame compared to these other weird examples. And some examples of first season Ernie and Bert segments that primarily set up a pun for the ending punchline: Ernie having bacon and X, Ernie having an X-ident, Cookie Monster eating bacon and X, Ernie finding an X treasure (wow, a lot of X puns in the first season! ), the "I 8 the sandbox" trick, Ernie drawing a tree instead of a three, Ernie writing a letter (M) to his cousin, the aforementioned buzzing B, and the T bit. Of course, as I said, there's also plenty of post-season one E&B segments to end with a pun - 10 Q, Happy Birthday to U... But they seem to be played different and don't seem to have occurred so frequently. I included that as an example of "Actually Pretty Funny" on the TV Tropes page for Sesame Street. Especially since, when they had found Dr. Livingstone and Ernie briefly considers not asking the question, Bert points out, in a frustrated tone, that they traveled all that way. I've been watching that one for the last few years, it is a great one. I feel like it's somehow different from other segments where Ernie makes Bert do something he doesn't want to do only for Ernie to be ready to end it when Bert is starting to enjoy it. Maybe Bert enjoyed it the whole time, or maybe it's because he did better than Ernie thought, or maybe it's because Bert doesn't seem to be upset that Ernie wants to end it. We've talked about the certain little nuances of certain performers' puppeteering before, but it's just now occured to me that Stacy Gordon has a rather interesting way of moving Julia's head whenever she speaks: like her entire head has a slight bounce to it when hitting each syllable while speaking or singing. Did the three pigs not eat their swill when they were piglets? I don’t really get that maybe it’s easier to puppeteer or they’re using props and they need the hands. Well, for one thing, the use of the Three Little Pigs as those pink AMs predate any of those other puppet pigs. Plus, they have a more cartoony look which suits their storybook origin. Oh! you're right . Still, it would be really jarring if they were ever in a scene together. Everyone knows that the three little pigs are a different species of pig. They are ‎"Sus domificator". Oh the lengths we'll go to for pig jokes. Miss Piggy would not approve. I mean, if the punchline were in French maybe she'd at least have a begrudging respect. Is there something Biff isn't telling us? BertFan, LittleJerry92 and ConsummateVs like this. Oh, here's another thing that I noticed...it seems like every year now we get one street story where Prairie Dawn stomps on Rosita's feelings. Looking at the guides for episodes 2681 and 2737, I wonder if the endings were swapped. Both episodes involve Gabi and Irvine going to day care, the first one has a scene where Oscar talks about playing peek-a-boo with Irvine, and then the final scene in the other one has Oscar and Irvine playing peek-a-boo. I feel that closing scene would make more sense with the earlier episode. The first season show content at the CTW Archives lists a lot of segments that don't have episode numbers applied, including Jazz #7, Jazz #9, and Jazz #10, all of which aired in season 2. Considering that was a recurring segments and the others seemed to air all the time in the first season, I wonder what took the other three from airing in the first season. Another segment listed as being produced in season one but not airing until season two is S-Superman, I would think with that having a famous licensed character that it would have aired sooner. I've also noticed a number of instances where it mentions street scenes. There are many street scenes that probably could have been listed but aren't, and a lot of them only have one episode number listed, but why some and not others? For years I noticed the "Brotherhood of Man" number being listed as "Block Party) Brotherhood of Man", I thought that was interesting, then saw it was part of an episode involving a block party... But until recently I overlooked the fact that only one episode was listed for it (maybe they planned to repeat it later?). The first season show content also lists Ernie and Bert's bit from the first episode, talking about the number 2 film and introducing the letter E film. At first I wouldn't have expected that one to be repeated because it'd need to be in episodes sponsored by 2 and E, then I found out the whole first week had the same sponsors... But this one supposedly didn't air again (well, it doesn't have "dump" written by it, so it could have aired after the first season), but I wonder why list that one? Though many of the street scenes listed are ones with Muppets who aren't Big Bird or Oscar, or rare ones involving Buddy and Jim. I noticed for years two segments listed as "Balloons I (Gordon and Big Bird)" and "Balloons II (Big Bird and Monster)", with no numbers by the second one - then I found an episode with both segments (so I guess they were a two-parter). And I saw one listed as "Jim: Big and Little", with only one episode listed, but looking at the episode guide, it lists it as a street scene, which surprises me (also by mistake, it says that introduced Kermit's lecture on tall and short, but the CTW Archives document says it leads "Kermit Big and Little" bit). But even if it's listing all street scenes with Muppets other than Big Bird and Oscar, there's no mention of the scenes from episode 1 with Ernie in Hooper's Store, Kermit watching Bob's W dollar, or the closing scene from the episode. Lately, when learning what seasons certain segments debuted in, I've found that quite a few of the ones I had been wrong about had debuted in either season 10 or 20 (in terms of first broadcast episodes to include them). For the most part I'd just been guessing, but it is interesting that so many segments that I guessed might have premiered in, say, season 8 or 12 debuted in 10, or segments that I might have thought premiered in seasons 18 or 19 first aired in season 20. Right now I'm trying to remember what season 10/20 segments they were that I thought debuted at a different time. I think the segment with Ernie telling Bert to guess what's in each item of clothing is one of those season 10 segments, and at least some of the "Detective Series" segments premiered in season 20 (the first one debuted in season 18 and then additional segments debuted in season 20), I assumed those began in season 16 or 17 (and actually, about a decade ago, I thought those premiered within the first five seasons; some of them just have the plain white backgrounds associated with segments from the first season and a little beyond). Aside from those, in the last week I feel I've found a number of first appearances that reveal segments first aired a year later than I had thought. It looks like Fuzzy and Blue first aired in season 13 as opposed to season 12 like I had thought, and I think Me Gotta Be Blue first aired in season 14 as opposed to 13 (and these were based on copyright dates.... many of the copyright dates for Sesame Street songs reflect the date that the seasons ended), and Sesame Street News: First Day of School premiered in season 13 as opposed to 12 (did Hulu say that it debuted the previous season?). Even though I'm basically guessing, I have a hunch the 1992 re-recording of Sam Pottle's theme to "Monsterpiece Theater" was orchestrated by Dave Conner. It sounds like something he would've done, with that lush orchestral feel. We've talked about how we've noticed things in the individual performer's overall puppet manipulation. I've noticed that Steve particularly emphasizes the "Henson Punch" in his mouth movements, in that he "punches" the head forward on each syllable. Another puppetry movement post as well, but I happened to notice it looks like Frank Oz might be doing the puppetry for the keyboardist and Richard Hunt as the drummer in NTV. I love this song so much, but UGH! I always hated how awful the lip-synching was. On another note, were the AM's that were sitting on the porch in other skits? I feel like I saw them somewhere else too. Speaking of which, has anyone ever noticed how often they recycled that brownstone facade for Muppet inserts? Oh yeah, I noticed that quite often.